Having a cold in general can be disruptive for a good night's sleep. However, if you have nighttime disordered breathing such as sleep apnea or hypopnea, a cold could make breathing at night even more of a challenge and may leave you wondering if you should use your CPAP during your illness. The answer to whether or not you should use your CPAP with a cold depends upon how your cold is affecting you. In most cases, as long as you use a decongestant and a full face mask or a face mask that covers both your mouth and nose, the answer is yes. If you already have trouble breathing at night, you need to keep using your machine to help you even when you have a cold so the cold does not compound your problems. There are circumstances where it is recommended you should not use your CPAP machine. According to Sleepapnea.org and Clinicalsleep.com, if your cold causes sinus or ear pressure, forced air can cause more pressure on your sinuses and ears, exacerbating these problems and potentially causing headaches. If you already have underlying issues with allergies and sinuses and you catch a cold, your CPAP machine could cause complications with ear and sinus pressure. If you get a cold and you are using a CPAP machine, the best thing to do is to call your doctor. A cold isn't just a cold for people with sleep apnea and hypopnea; it could complicate your condition. Your doctor will have advice on a course of action that is best suited for you. For most people, it is fine to use your CPAP Machine when you have a cold. Arlington Sleep Medicine explained some tips you should follow to help you get a good night's sleep even when you have a cold, allergies, a sinus infection, or other infections that would compromise your breathing. Most newer machines have this feature to combat dry nasal passages, nose, and mouth while using the device. This can be especially useful during the periods when you have nasal congestion. If you have an older machine, you might need to add this feature onto your machine. This is a natural way to clear sinus passages right before bedtime. You can buy a saline rinse, or you can make your own just by adding one quarter of a teaspoon of salt to a cup (8 ounces) of warm, distilled or filtered water. Use a container where you can get the solution into your nose and do each nostril. Decongestants and antihistamines have two different actions. Decongestants are used for colds or flus, and help clear the sinus passageways. Antihistamines help clear sinus passages by reducing the swelling and inflammation in the sinus passageways and are used to help alleviate symptoms of allergies. Some medications have both decongestants and antihistamines. Some nasal sprays have steroids in them to help decrease inflamed sinus passages. Although these are used for people who have breathing issues of a more chronic nature, these can also be used to alleviate inflammation in breathing passages. Prescription and over-the-counter medications are available for decongestants and antihistamines, and are available in pill form and in nasal sprays. It is recommended that you use nasal sprays only short term, only for three or four days. If you use them longer, they can hurt your sinus passages and you will get rebound nasal congestion caused by overuse of the nasal sprays. If you feel you need assistance with choosing the right medication, you should consult your doctor. Use a pillow that will support your neck and shoulders and elevate the upper part of your body. Pillows are available that will elevate your head and shoulders from your waist in a gradual manner and fully support your entire upper body. This will ensure your head isn't forced forward in a position that will obstruct your breathing. You can also use pillows to elevate your mattress from underneath so your head and shoulders will be elevated. It is not recommended to use pillows to elevate your head only because it might force your head forward and block your air passage while you sleep. If you are really clogged up, you should have an extra mask handy that will cover either the entire face or one that covers your nose and mouth so you can breathe through your mouth. If that seems like a full face mask would be uncomfortable, there are masks that cover both the mouth and nose and will help you continue your CPAP therapy if you have to breathe through your mouth. Full face masks could be an expensive investment, and a full face mask could encourage the infection to spread in some individuals, especially if colds, sinusitis, and ear infections are an ongoing issue. For an investment of under $200, the person can use the SinuPulse right before the CPAP machine, and it will help clear the sinuses. Reviewers on the site say that it is worth every penny and works beautifully. The Capital Health recommends you clean your equipment with a mixture of vinegar and water to maintain your equipment and avoid reinfection. Your unit also might have arrived with a booklet on how to care for your machine and might have some good tips on how to clean it after an infection. You should also clean your mask according to manufacturer instructions in order to avoid reinfection. A cold to most people can be inconvenient and an annoyance. However, when you have a condition that causes sleep disordered breathing, a cold needs to be taken more seriously. It is important to check with your doctor to ensure you can continue to breathe throughout the night. Your doctor might suggest a visit or have recommendations on the types of medications you can buy to help you get a good night's sleep. Either way, it is important to seek medical help so you can continue to breathe throughout the night. 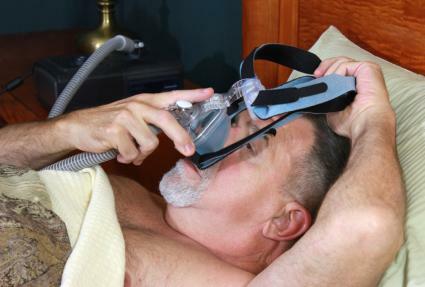 Most importantly, continue to use your CPAP machine unless your doctor tells you otherwise.